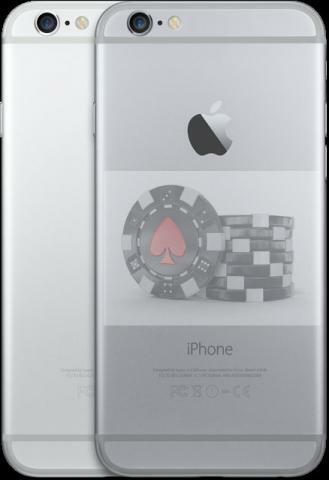 Which Online Poker Sites And Which Poker Games Are Best On Your iPhone? I’ll start this article by stating the obvious about what people are not looking for when it comes to iPhone poker games. First up, multi-tabling is effectively out – players often ‘grind’ 12+ tables at once online to make a decent hourly rate. 8 hour long poker tournaments with 1000’s of opponents are also not ideal. If you do go deep one night, the option to take your tournament to bed is not a bad one though! Ideal games are dip-in and fast action. They have recreational opponents rather than the hordes of multi-tabling nits at some sites, and work well on your iPhone screen. I have spent many hours testing exactly this type of game – and this article outlines the very best online poker options for both US and non-US players. Cash games and Sit N Goes are fine, though for the best poker action I recommend fast-fold poker games, for Worldwide players Snap Poker at 888 is a particularly cool option – more on that below. First below the somewhat limited options for US players are discussed, where only Merge (Carbon) has a dedicated mobile poker client at the moment. After that the key options for players outside the US are covered… in a much longer list. Of all the gambling verticals, poker relies on high numbers of players the most. You need a big pool to be able to offer higher prize tournaments, spread different poker formats or keep the high stakes tables running. At the moment, none of the cool offshore sites welcoming US players have enough players to warrant investing big bucks in their poker clients. This means that the options available are browser based. Bovada (the biggest US site) have a HTML5 client, though this is not properly adapted for iPhones. The only viable option for poker fans is Carbon Poker on the Merge Network, who have No-Limit Holdem cash games which are adapted especially for iPhones. Here is a screenshot – the game is fast and functional and does fill the void for iPhone poker fans. There tournament options on the way. Keep an eye on my news section for the latest on this and other US iPhone poker game news. You’ll need to register via the Carbon Poker website, and then play from there. Fortunately, Carbon do offer very easy deposits for US players – and one of the most generous welcome bonuses too! This is where things get interesting, with several killer options to choose from. I personally love PokerStars’ app and the 888 one too, though plenty of other people swear by Full Tilt’s Rush Poker or stay with the old favorites Party Poker. I’m giving this one my number 1 spot for two reasons. First the lack of ‘grinders’ make the games here a lot easier to beat, which is ideal for those players just learning the ropes. The design is also the best out there for me, you can access cash games, sit n goes (smaller tournaments) and the crazy world of ‘Snap Poker’ which is the fast-fold variation at 888 via their app. To top things off for this rec, 888 give players up to $88 free to test out the games. You get $8 in tournament tokens and cash game buy-ins right away (no deposit or credit card info needed) and then 10 more increments as you collect points by playing real money games. Either scan the QR code or click this link and check out the coolest iPhone poker app for yourself at www.888poker.com. You can really see how much resource and money PokerStars put into the development of their iPhone app. It is super-smooth, looks great and lets you play up to 4 tables at any one time. You can access all of the different games on this app, including multi-table tournaments. I’d advise you to stick to the tournaments with capped field sizes (like the 180 Sit N Goes). With late registration you will find the fields can double after the official start time and take many hours to complete. There is no doubt this poker app is awesome, and the choice of games is bigger than you will find anywhere else online. To balance this you will find more small stakes pros at this site. There are still plenty of novices too – though you will need to make sure you are not sat in a game with a bunch of poker geeks to really profit from the games. You can download the app via the PokerStars website. Register with affiliate marketing code PSP3108 and then deposit with bonus code STARS600 to receive 3 ‘first’ deposit welcome bonuses up to a total of $600. Check out the smoothest poker app now via www.pokerstars.com. Big bright and bold, and full of ‘novice players’ (that’s fish to you and me), Party Poker have a brand new app and are already carving out a major market share. You can reach cash games and ‘Fast-Forward’ which is their pooled fast-fold poker variation via this app. The games are very easy to play, with big clear buttons in just the right spot for your thumbs in landscape mode. Party have ‘socialized’ the game somewhat, deterring grinders and including challenges, achievement awards and sharing within their software. This was combined with shutting out a lot of the eastern European countries who were clogging up their lower stakes games with nitty ‘bonus whore’ types. All-in-all a positive move for the site, who are seeing signs of success for their new model already. From a player perspective, the games are super-soft and the app looks and plays great. If you are an amateur poker enthusiast and only want to play one table at a time, then this is a good pick. You can download the app via www.partypoker.com, if you deposit then claim your 100% welcome bonus with bonus code PBCLUB. When you play any normal poker game, the majority of your time at the tables is spent waiting for other people to bet and complete their hands. Any decent player folds more hands than they play, and when you get a slow player or two in the game it can seem like an age before you get dealt a new hand. Fast-fold poker fixed this issue. The first game was called ‘Rush Poker’ at Full Tilt. This worked by keeping players in pools instead of sitting them at tables. To play a poker hand, you can combined with 5 other players from your pool, with the big blind going to the player who has not had this for the longest time. Cards are dealt normally, though as soon as you fold – you are recombined with 5 more players and a new hand starts. You do not even need to wait for your turn to act before folding. Simply hit the fold button and off you go. The remaining players in the hand will not see that you have folded until the action reaches you. This type of game is just perfect for iPhone users. It us up to 4 times faster than a normal game, meaning you can cram in a ton of hands in a short session. You’ll also find games at a wide number of buy-ins (typically starting at $2 and going up to $200), and in different formats and table sizes too. Many sites have these games nowadays. Each has a unique name including Zoom Poker at PokerStars, Snap Poker at 888 and Fast-Forward Poker at Party. For bigger buy-in fans I recommend Zoom at www.pokerstars.com, for newer players you can learn the ropes and make money at the same time in the Snap Poker games at www.888poker.com. … then it would be the coolest software combined with easy games – at 888 Poker. You can get up to $88 free to check out their app, $8 right away with no deposit or credit card information needed. If you like what you see then the 100% welcome bonus will still be available to you. Check out www.888poker.com to get details of how to download the coolest iPhone Poker app now.